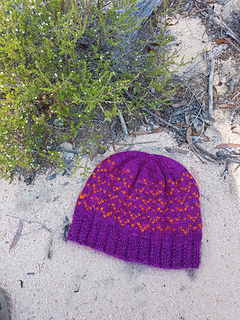 Beautiful plump merino makes for the most decadent stranded colourwork hats! Knitcraft and Knittery Aran Weight Merino is no exception. 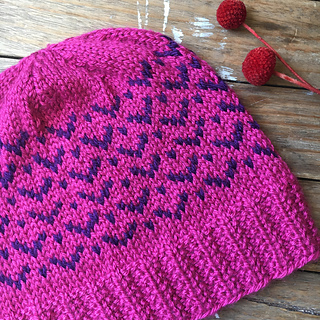 Wynyard features simple rhythmic colourwork in two colours, with charted and written instructions, as well as a photo tutorial to help neaten the “jog” that appears when working in the round. 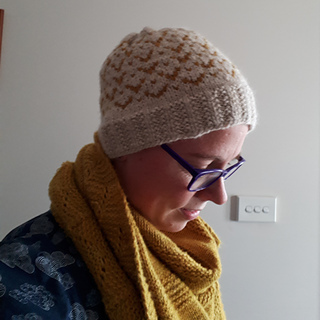 The result is a seamless, beautifully thick, warm beanie. Seeded ribbing gives way to colourwork, with a lightly-gathered crown to top it off. Wynyard comes in five sizes, and will be an excellent go-to warming beanie for every head you care to cover (from bubs to big noggins). 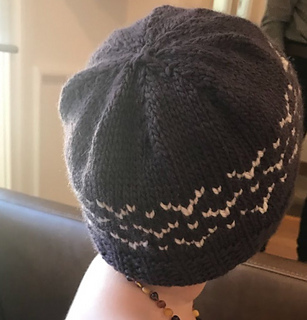 Wynyard can be worn slouchy or with a rolled brim. Samples shown in Knitcraft & Knittery Aran Weight Merino ‘Evergreen’ and ‘Ruth’, sizes Child (pink) and Adult (green). Models’ heads measure 53cm. Two skeins yielded both hats. Feature photo: baby is 9 weeks old and wears the Bub size. Wynyard has been professionally tech. edited and test-knitted. 40cm/16” circular, or 30cm/12” circular for bub/small child sizes. Suggested needle size: 4mm/US 6. 40cm/16” circular, or 30cm/12” circular for bub/small child sizes. Double pointed needles (or longer circular for magic loop). Suggested needle size: 5mm/US 8. Suggested needle size: 5.5mm/ US 9. Adjust your needles as required to match tension. 22 stitches and 32 rounds = 10cm/4” in seeded ribbing, blocked, worked in the round on size A needles. 20 stitches and 24 rounds = 10cm/4” in stocking stitch, blocked, worked in the round on size B needles. 20 stitches and 24 rounds = 10cm/4” in colourwork pattern, blocked, worked in the round on size C needles. Morgan’s lovely yarns can be found on her website here. 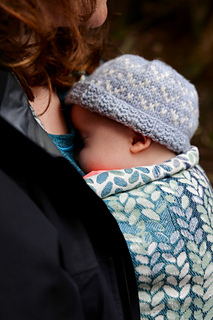 Depth is adjustable, and the pattern contains additional information on fit. My thanks to my wonderful team of testers, and to my daughters for modelling.